As the veteran of the business lending team, Clark brings over 30 years of business financing experience to the credit union. He has owned several small businesses and understands business financing from both the business owner’s and lender’s perspectives. Clark has wide ranging experience and has served as SBA lending manager at several financial institutions. He is tenacious in meeting the financing needs of business owners. 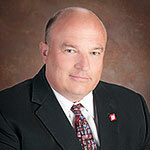 He also serves as Northern Regional Manager supervising seven retail branches. Clark holds a bachelors degree in business management from Weber State University. Clark promises that you will be well pleased by financing your business with University Credit Union.